Constantine is on a bike trip in Provence, enjoying beautiful weather, great food, and excellent company. It's also a vacation of sorts for me, since the nest is now truly empty. I spent the weekend with the kids, doing some lovely things, but Monday was all for me. I didn't even exercise, though probably should have. I went up to the sewing room with my breakfast and came down only for food! I finished my Sallie maxi dress, and like the pattern enough to do it again, but with better fabric choices. 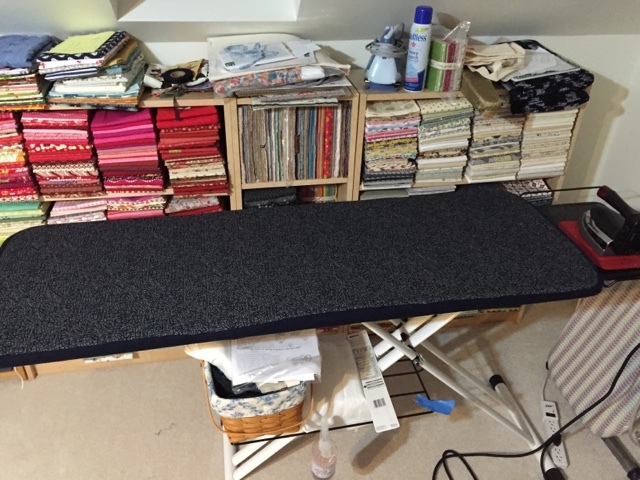 My ironing board cover finally pushed me over the edge into action. It was too short, having shrunk with the copious steam and heat. I covered it with a fabric that I recently got from "fashionfabricclub" that is very pleasing to my eye and will likely be very durable. I used a linen from my stash, wrong side out, to make the drawstring casing, and "Bob's yer uncle," got that thing done in no time flat. Very satisfying to gaze upon, though not particularly pretty. My water has a lot of iron, and so there is an eventual rust look to the board, despite filtration. This informed my choice of cover fabric. Then I did something I've been wanting to do for a while. I took out my embroidery module and stitched out a few designs. 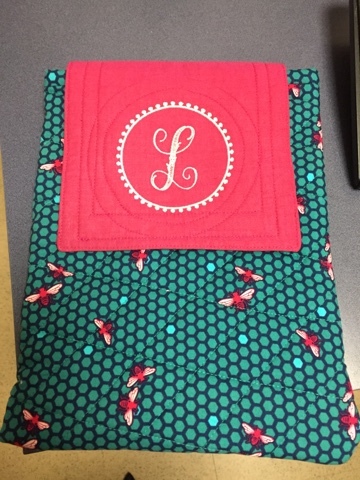 Lisa had asked me for a case for her beloved Nook, and I didn't get it done in time for her trip to Aruba, but here it is, and I love it. I would not have preferred to do the quilting stitches on the monogrammed flap, but I forgot to put the Velcro on the back of the flap before construction, so it was going to have stitching showing. Live and learn, maybe. 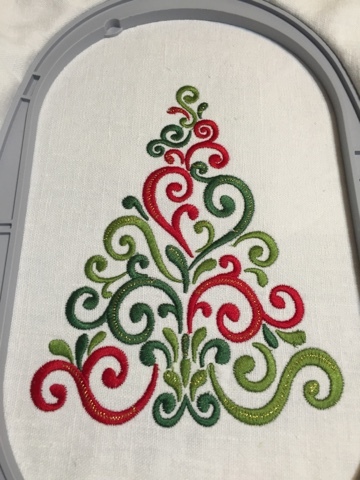 Then, there was the new embroidery design pack I bought because it was on sale and had at least 2 designs I love. Fairy Frost must be a "last year's model," but Christmas designs really should transcend trend. I stitched out this design and even got the courage to put gold thread in there. It worked without a hitch, though I did slow the stitch speed to about half for that part. I'm going to try the applique Santa for a pillow for Sophia if I get the time and nerve. The hardest part of embroidery is the preparation of the substrate, as the rest happens almost automatically. I have to remember that and prepare many at once. Walking out onto the front porch to spray the adhesive is the hardest part!